A three-level venue boasting sublime views across Elizabeth Quay, especially from the rooftop bar. This stylish three-storey venue was named after the Swan River Colony's pioneering civil engineer Henry Willey Reveley. The spacious bar-restaurant hybrid boasts stunning views of the Swan River, al fresco seating and a menu that showcases the best produce in Western Australia. And we're guessing Henry would be proud. We suggest heading straight to the top floor of the Reveley for the full rooftop experience. 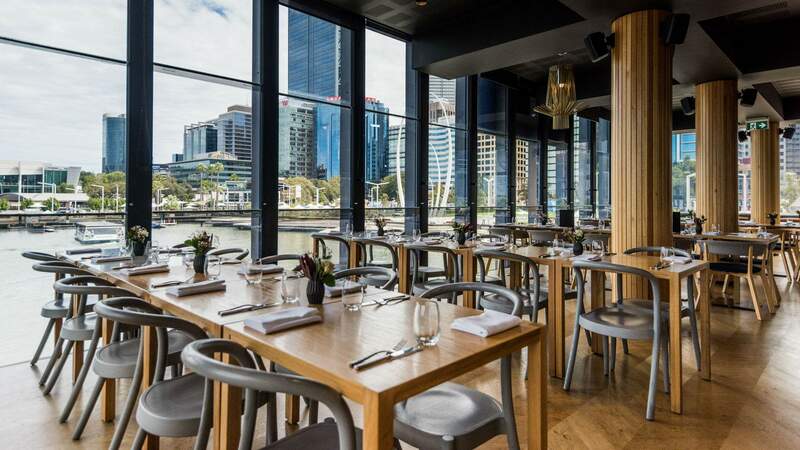 Dubbed Henry's Rooftop, it offers sublime views across the water at the (finally) finished Elizabeth Quay. To keep the Henry theme going, order the signature cocktail Henry's Paloma ($15) — tequila, grapefruit soda, agave nectar, lime and rosemary salt — and watch the boats dock in the distance. A fully loaded snacking menu on the roof features three kinds of cheese, oysters and olives for the fancier among us. This is balanced perfectly for the rest with pork ribs, popcorn chicken and beef brisket sliders. With the Bell Tower just across the road, this is a true Perth experience. We recommend making your way down after work to catch the sun setting across the river.